This is the first in a series that will explore communities along the river from Davenport, Iowa, to Minneapolis, which was the route of the Grand Excursion in 1854. We will complete our journey up the river at about the time the re-enactment of the Grand Excursion begins in Davenport in June 2004. On June 5, 1854, the Excursionists left Chicago and traveled 181 miles to Rock Island, Ill. on the new Chicago and Rock Island Railroad. Five boats with 1,200 on board crossed the Mississippi from Rock Island to Davenport, Iowa. After speeches and fireworks, the boats traveled overnight to Galena, Ill.
Click on the arrows to continue your journey upstream. 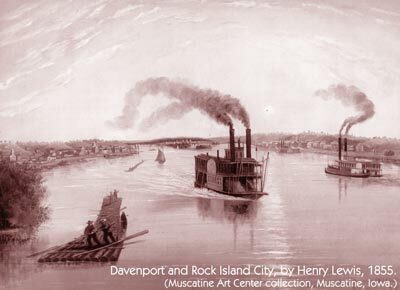 The first railroad reached the Mississippi River at Rock Island in 1854, and a few years later the first bridge crossed the river to Davenport. Soon the river was lined with farm implement companies building the plows, rakes and other agricultural machinery used to turn the prairies into wheat fields that fed the growing population of the Midwest. In Davenport and other places along this stretch of the river the hills rise gradually from the banks, providing many homes with a great view of the river. In modern downtown Rock Island, you might spot a massive painting of Black Hawk, a war chief of the Sauk and Fox Indians who lived in a village near what is now Sunset Park, on the Rock River. In the War of 1812 they fought rather successfully for the British. In 1831 the band was forced to abandon its village and cross the Mississippi. In 1832, Black Hawk led about half of the band  including women and children  back across the river to reclaim their homes. At Fort Armstrong, on Arsenal Island, the outnumbered soldiers watched from inside the walls. In the war that followed, the U.S. Army and Illinois Militia pursued the band up the Rock River into Wisconsin and massacred many people on the banks of the Mississippi River. Bix Beiderbecke was seduced by jazz music from a passing riverboat as he stood on the banks at Davenport. Soon he was entertaining riverboat passengers with his trumpet. Every summer the Bix Beiderbecke Memorial Jazz Festival brings jazz back to the riverfront of Davenport. Arsenal Island is still a busy army base, and the Army Corps of Engineers Rock Island District is headquartered there, near Lock and Dam 15. The center at the lock and dam offers a great view of the lock and information about the Upper Mississippi and the lock-and-dam system. Though parks, water taxis and bike trails have replaced many of the tractor and farm implement factories along the river, John Deere & Company is still an important presence in Moline, Ill.
Upstream and across the river from Campbells Island, Alcoas Davenport Works, stretches along the river for a mile. The huge aluminum plant encloses 128 acres under one roof and has its own electrical generating plant. Farther upriver, Port Byron, Ill., and LeClaire, Iowa, sit on opposite sides of a channel so narrow that teams from both cities compete in tugs of war across the river every summer. Buffalo Bill Cody was born in LeClaire in 1846. Today visitors learn about him at the Buffalo Bill Cody Museum there. For more information on the Grand Excursion 2004, call (513) 381-6700.